A flaky and light pastry used in layered pastries (different from phyllo pastry which is crispier). Usually made with butter but can be made with vegetable shortening or lard. Method for making is to spread the solid fat on top of the dough, and then to repeatedly fold and roll out the dough, whilst keeping it at a cool temperature. In baking, a puff pastry is a light, flaky, unleavened pastry containing several layers of fat which is in solid state at 20°C (68°F). In raw form, puff pastry is a dough which is spread with solid fat and repeatedly folded and rolled out, and used to produce the aforementioned pastries. It is sometimes called a "water dough" or détrempe. Buying: You can purchase at your local bakery! 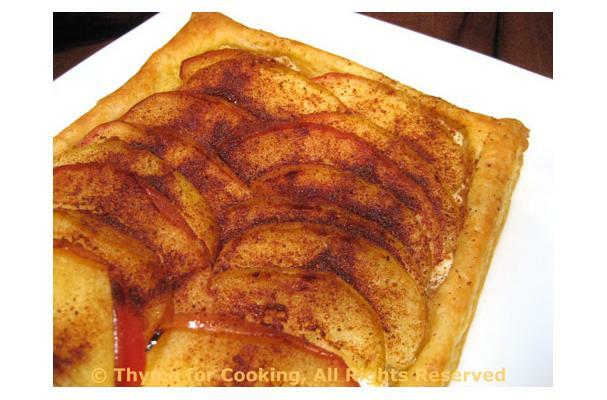 Puff pastry can be used as a basis for small tarts or pastries, both sweet (apple) and savory (basil and goat cheese). It can also be used as a basis for traditional pizza and large tarts with tomato, asparagus, zucchini or other vegetables. History: Puff pastry seems to be a relative of the Middle Eastern phyllo, and is used in a similar manner to create layered pastries. While traditionally ascribed to the French painter and cook Claude Gelée who lived in the 1600s (the story goes that Gelée was making a type of very buttery bread for his sick father, and the process of rolling the butter into the bread dough created a croissant-like finished product), references appear before the 1600s, indicating a history that came originally through Muslim Spain and was converted from thin sheets of dough spread with olive oil to laminated dough with layers of butter, perhaps in Italy or Germany.